:It is 1941 and America teeters on the brink of war. Outgoing naval officer Ensign Jim Avery escorts British convoys across the North Atlantic in a brand-new destroyer, the USS Atwood. Back on shore, Boston Navy Yard secretary Mary Stirling does her work quietly and efficiently, happy to be out of the limelight. Yet, despite her reserved nature, she never could back down from a challenge. When evidence of sabotage on the Atwood is found, Jim and Mary must work together to uncover the culprit. A bewildering maze of suspects emerges, and Mary is dismayed to find that even someone close to her is under suspicion. With the increasing pressure, Jim and Mary find that many new challenges--and dangers--await them. 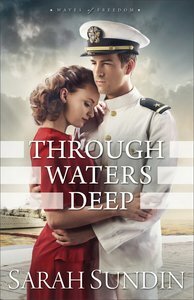 About "Through Waters Deep (#01 in Waves Of Freedom Series)"
Customer Reviews For "Through Waters Deep (#01 in Waves Of Freedom Series)"
As always, Sarah Sundin has created characters that I can't help loving, despite wanting to give them a good talking-to when they make mistakes! I think that is what makes her characters so endearning: the fact that they are so very flawed and human. Unlike Sarah Sundin's earlier novels, this one has a 'mystery', as Mary aids the FBI in uncovering a sabatour in her Navy workplace. I'm not entirely sure I like this mystery sub-plot: yes, it adds intrigue and suspense to the story, but I liked how her other novels are very 'ordinary' in that you can imagine that the events really happened in the ordinary, everyday lives of people living in the extraordinary time of war.